Let’s start with similarities between the two types of practitioners. After all, they both tend to be part of the same Marketing organization, right? Specialize in forms of marketing data. Analyze and interpret large amounts of data, often from disparate sources. Help marketing organizations be more successful (website, campaigns, etc.). 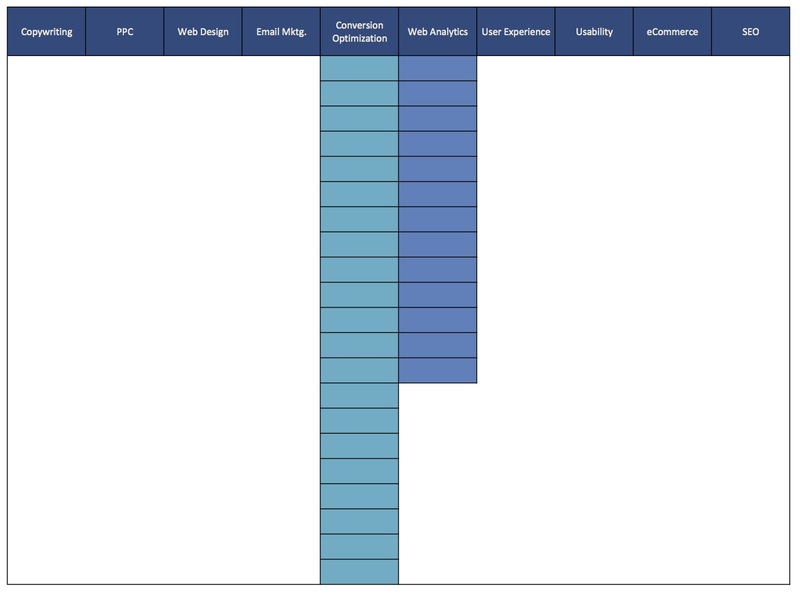 Tend to have “T-shaped” skill sets (here’s mine as an example), with deep knowledge in core areas, and general knowledge about marketing and/or web stuff. Are in relatively new, developing disciplines (compared to Accounting, for example). Focus in time: Web Analysts tend to focus on past performance, or increasingly on the “real time” present. Conversion Optimization specialists tend to focus on the future of “what could be” if certain changes were made to a campaign, landing page, or experience. Web Analysts tend to be more comfortable swimming around in data, and tend to be more comfortable with large data sets (structured or unstructured). Conversion Optimization specialists are more likely to stay within the UI of their testing software, and less likely to use spreadsheets to pivot, chart, etc. Conversion Optimization specialists tend to focus much more on human psychology, especially that of the target audience. They play in the qualitative world of influence factors, motivation, intent, and persuasion. Web Analysts tend to stick to the quantitative measures of how many people did X, how often, in which channels. Web Analysts are extremely competent at finding patterns in data, and at finding anomalies in data. They are the crucial “middle layer” between the deluge of data that flows into marketing organizations every hour, and powerful insights that drive business improvement. For me, the best way to get to the net summation of this is to say that Web Analysts are primarily concerned with looking for patterns (and anomalies) in data, and communicating those findings to a business audience. A great Web Analyst needs to know how to communicate data in a visual way, as well as be a good “storyteller” with data. Conversion Optimization specialists are primarily concerned with the “levers of change” that marketers have at their disposal. This is very broad, and could include things like pricing/promotion, design language, persuasion, copywriting styles, usability, and more. These folks spend the bulk of their time playing with these levers (via experimentation) to understand which ones can be used in which situations, and what the caused effect is. The best way for these two types of specialists to work together is for Web Analysts to surface insights from the large marketing data set, and communicate them to the Conversion Optimization specialist. The Web Analyst might have theories about the “why” of the behavioral data, but should ultimately defer to the Optimization specialist when it comes to qualitative data and user behavior. 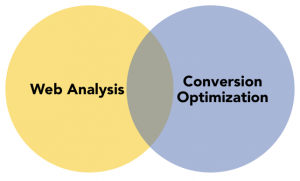 The Conversion Optimization specialist should take the insights from here and develop hypotheses around them, test plans to attempt to prove the hypotheses, etc. They should guide the ideas through a tactical experimentation process, and interpret the final results if they are statistically significant. The test results should be fed back to the Web Analyst afterwards to help them better understand the behavior of the target audience, which will help them more easily find valuable insights and anomalies in the future. 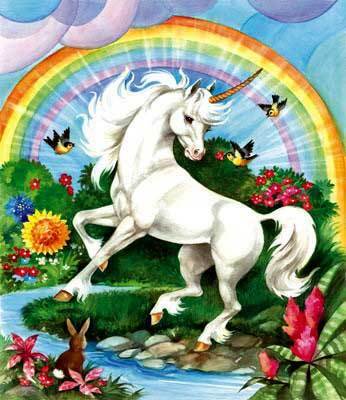 In a perfect world, you can see that a fantastic feedback loop can be created, both specialists can become more efficient, and rainbows and unicorns can frolic under blue skies, filling our Marketing days with laughter, joy, cinnamon, and spice. Also, the cops will have wooden legs and the bulldogs will all have rubber teeth and the hens will lay soft-boiled eggs and the farmers’ trees will be full of fruit and the barns will be full of hay. (It’s a song). Do you agree with my assessment of the core competencies? Have you teamed up in an analysis/optimization process at your company? Let me know in comments! This entry was posted in marketing optimization, web analytics and tagged conversion optimization, conversion optimization specialist, web analyst by brendanr. Bookmark the permalink.